The more things change, the more they stay the same. In the last 15 years, Nepal suffered a deadly war, abolished the monarchy, turned into a secular federal republic and an elected assembly passed a new constitution. 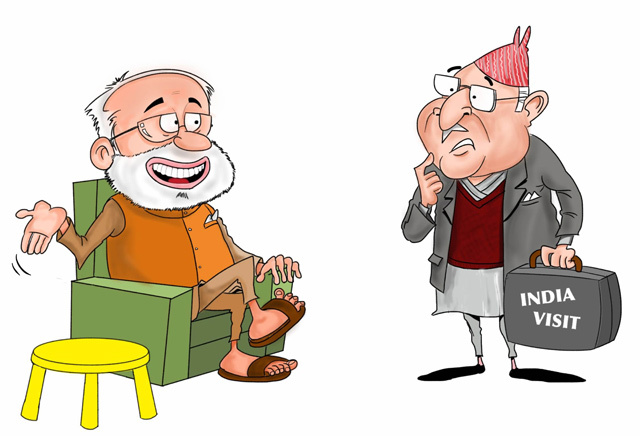 But Nepal’s relations with India have always been mired in distrust, marked by New Delhi’s boorish behaviour and Kathmandu’s kowtowing. 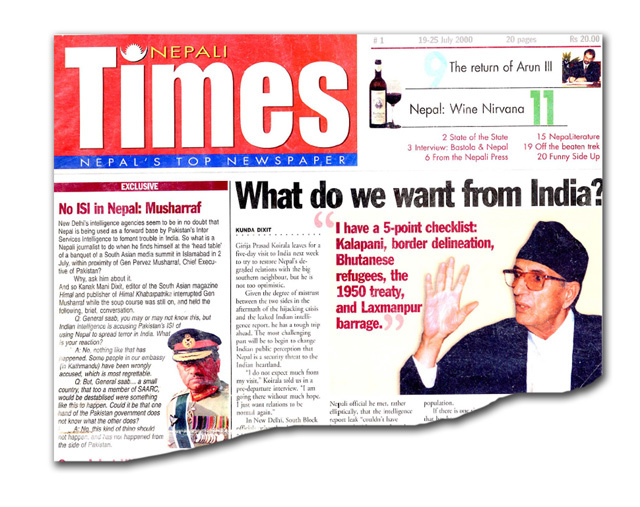 In our very first issue in July 2000 (below), Nepali Times analysed Prime Minister Girija Prasad Koirala’s visit to India as an effort to ‘restore Nepal’s degraded relations with the big southern neighbour’ after the hijacking of an Indian airliner on a flight from Kathmandu to Delhi. Prime Minister KP Oli is on a six-day state visit to India from Friday with the same goal two weeks after the five-month ‘unofficial’ Indian blockade was officially lifted. Despite the timing, the visit is going to be largely symbolic, a chance for both sides to mend fences, do some damage control and save face. “Rather than signing new deals, the PM will push for implementation of past agreements on projects like Pancheswor, Tarai roads, integrated customs, and the release of the $1 billion pledged by India for post-earthquake reconstruction,” Pradeep Gyawali of the UML told Nepali Times. Oli assured parliament this week he would not sign any anti-national treaties during his India visit. The fact that he even had to say such a thing points to the sensitivities involved. On Thursday, he called a cabinet meeting and reiterated the promise to ministers. However, Oli may not be content with having stood his nationalist ground for so long against India, but return with substantial goodies. The cabinet decided to form an all-party mechanism to review federal boundaries, part of the proposal Foreign Affairs Minister Kamal Thapa agreed to in New Delhi in December to get the blockade lifted. Oli wants to set up the body before he leaves for New Delhi so he can tell the Indians he is doing all he can to meet Madhesi demands. But Madhesi leaders are unlikely to join this mechanism, fearing backlash from their constituencies in the Tarai.